Mario and the Incredible Rescue is a short chapter book written by Tracey West and published by Scholastic Books Inc. in January 2006. It includes locations from Super Mario RPG: Legend of the Seven Stars, such as Kero Sewers, Tadpole Pond and others. 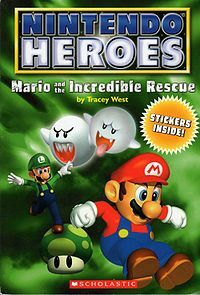 Like Link and the Portal of Doom, another title in the Nintendo Heroes series, this book includes stickers; they were taken from Super Mario 64 and various titles in the Mario Party series. 1.1 Chapter 1: Princess Peach Needs Help! 1.7 Chapter 7: The End? 1.8 Chapter 8: Watch Out for Wario! Chapter 1: Princess Peach Needs Help! The story begins with Mario and Luigi relaxing, with Mario proclaiming that the Mushroom Kingdom is safe. Toad comes running to the brothers, tired and out of breath, informing them that Princess Peach had just been captured by ghosts and taken to Bowser's Keep. Knowing he has to fight Bowser again, Mario readies to go on adventure, as Toad and Luigi hesitate. Mario approaches a pipe, explaining that it will take them to Kero Sewers, and serve as a shortcut to the Keep. Mario enters, as Luigi and Toad follow, and the trio encounters a group of three Little Goombas they defeat. They come upon a "T" in the tunnel, one that goes left, and one that goes right. As a whole group of Goombas begin to pour in from the left, the trio runs into the right passage and stop at a brick wall blocking their travel. The three of them begin kicking the wall until it breaks apart, revealing a small chamber full of coins. After encountering a second wall, Mario, Luigi and Toad break open a small hole which they crawled through. The three of them find themselves in a mysterious, unknown forest; they look back, and realize the wall they had just come through was no longer there. Confused and scared, the trio continued and encountered a small stone cottage. Stepping inside, they meet Cybele the Sorceress, who offers to help them in exchange of something. Luigi hands her a coin he got from the chamber in Kero Sewers. She begins explaining that Bowser has stolen a book from her titled The Book of Spells, that he has used to conjure up an army of ghosts. To defeat the ghosts, she explains that Mario must gather six different special mushrooms from different locations in the Mushroom Kingdom. With six mushrooms in hand, Mario must recite the words of a spell to send them back to their realm. She gives them a clue to where the first mushroom is located, which is a piece of flat wood shaped like a mushroom. She then gives Mario a blue pouch with long straps to carry the six mushrooms. Finally, she hands Mario a white envelope telling him to only open it when "there is no hope left." After leaving the cabin, Luigi and Toad gather around Mario and asks what the clue says. They glance at the wood, and read "SREWES OREK", and under it, "Go backward for the answer." Toad finds a pipe in the forest that they hop in, and they land back in Kero Sewers. Lost in the complicated maze of tunnels, they walk around and Mario is startled by a Piranha Plant that pops out of one of the pipes. Avoiding the Piranha Plants constantly popping out, they find the magical, black mushroom on the other side of a ravine. The only way across was a series of four separated pipes - if Mario was to miss a jump, he'd fall into the pit down below. Piranha Plants popped in and out of the pipes in rhythm. Mario went first and managed to make it across the ravine. Toad climbed on Luigi's back, as Luigi began hopping pipe to pipe. On the third pipe, the pipe wobbled, and as Toad begin to slide off of Luigi's back, Luigi was forced to toss him over the fourth pipe to Mario, who caught him. On the jump to the fourth pipe, Luigi lost his footing and Mario caught him in time. Having finally grabbed the magical mushroom, Mario secured it in the blue pouch he was given. He examined the second clue: "Look in a place where Frogs and Toads live in harmony". Mario figures out its talking about Tadpole Pond, explaining to Luigi that to get there they have to go through the Midas River. As they continued through the sewers, they heard the sound of rushing water. Mario led them in the direction of the sound of water, finding a pipe submerged in water to lead them to the Midas River. Two Koopa Troopas appeared on a ledge, blocking their path, and the brothers jumped on them, and then proceeded to kick them away. The shells rolled out of control, bouncing off a wall and crashing into the trio. They were pushed into the water, and the stream pushed them uncontrollably through the pipe. They passed through the pipe, and came out on the other end, as they approached a waterfall and then tumbled down. Finally, the three of them land in Tadpole Pond and are approached by Frogfucius. After explaining his mission to him, Frogfucius tells Mario the magic mushroom is in Melody Bay. The trio walks over to Melody Bay, and encounter Toadofski, sitting in front of a green magic mushroom. Toadofski offers to help the gang, and give them the mushroom in exchange for Mario to perform a song for him. Mario takes the flute and performs a song he titles "Falling Down a Waterfall". Toadofski awards Mario the magic mushroom, and he looks at the second clue: "F C O B R E E L S E T S M O A R Z C E", and under it, "Jump to find the answer." After figuring out the riddle presented to them, they realize the letters spell out Forest Maze, when only every other letter is read. Toadofski leads the trio through a meadow path, where the Forest Maze begins. As Mario, Luigi and Toad venture through the forest path, and after a series of left turns and right turns they came to face a sleeping Wiggler. They tip toed past it, and continued their series of turns, until coming across a spot in the maze that separated into many directions. The pouch begin glittering, lighting up and showing the trio the correct path. They walked through and came across the orange magic mushroom. After grabbing it, Mario read the next clue: "R Y S ' O T E L I S E", and under it, "This clue is like eggs." Mario figures out the clue is scrambled, and Toad figures out it points to Yo'ster Isle. While attempting to exit the maze, the trio came acoss two pillars, with a Hammer Brother on top of each one. After being hit by a hammer, Mario gave one of the bricks of the pillar a kick, causing the pillar to tremble. Luigi began kicking the other pillar, and as the trio dodged the hammers raining over them, the pillars finally crumbled. The Hammer Brothers landed on a sleeping Wiggler, which woke up in anger and began attacking them. Mario picked up one of the thrown hammers for future use, and then Mario, Luigi and Toad ran past the fight ensuing and escaped the maze. The three of them traveled on and came across a large pipe that Mario explained would take them to Yo'ster Isle. Climbing through, they entered and exited the pipe into Yo'ster Isle and came across Yoshi. Mario asks Yoshi if he's seen one of the magic mushrooms he seeks, and Yoshi confirms in nods. Mario tells Toad and Luigi to wait for him, as he will ride Yoshi to where the mushroom is to get there faster. Yoshi led Mario to the top of a hill where the blue magic mushroom was. Before Mario could read the clue formed by the mushroom, he was pelted by Spiny Eggs thrown by a group of Lakitus. Mario retrieved the hammer he had put in his pocket and began hitting the Spinies landing on the ground. Mario turned to see Yoshi jumping high to stick his tongue out and eat all of the Lakitu's clouds, forcing them to plummet down to the ground. Mario hopped on Yoshi's back and they ran back to Luigi and Toad. Mario retrieved the clue and read out, "The next clue is mine." Confused at the clue, they saw Yoshi beginning to dig into the dirt. Mario figured out the riddle: the mushroom was in a mine, specifically Moleville. Mario asks Yoshi if he wants to accompany them on their journey, and Yoshi confirms. The four of them jogged along and encountered a pipe leading them to Moleville. There, they came across a jagged mountain, with the entrance inside being blocked by a Chain Chomp. Mario hops on the pole attached to the Chain Chomp, and pounds it into the ground, freeing the Chain Chomp. The Chain Chomp becomes friendly, and rolls away from the gang. Inside the mountain, they enter a mine shaft and find a cart on a metal track that they all board it as it begins to pump along on the track. The cart took the gang straight to the yellow magic mushroom and Mario picked it up, and the clue formed. Mario pulls the lever controlling the cart, and they return to the entrance and read the clue: "2 15 15 19 20 5 18 16 1 19 19" and under it, "1-26". Mario and Toad figure out that each number corresponds to a letter in the alphabet, and figure out the riddle points them to Booster Pass. The gang hikes a short distance from the Moleville mountain to Booster Pass. Along the travel upwards, they are ambushed by a large group of Koopa Paratroopas. Mario, Luigi and Yoshi fought off the Koopas, jumping on them until they were all eliminated but one. The final Koopa slammed into Mario, seemingly sending the pouch of magic mushrooms flying over the cliff edge of the pass. Chapter 8: Watch Out for Wario! As Mario looked over the edge of the pass, he was relieved to see the pouch hanging on and caught to a branch growing out of a rock. Using a vine, Mario, Luigi and Yoshi lowered Toad to dangle him closer to the pouch so he could retrieve it. The four of them continued along Booster Pass, and find the red magic mushroom at the end of the road. On his run to grab it, a bucket lands on him, and he sees Wario flying over him on a plane (presumably, the Bulldog). As Wario began dropping buckets from the sky, Mario grabbed one, hopped on Yoshi's back, and they jumped high up. Though failing the first attempt, on their second attempt, Mario and Yoshi drop a bucket on Wario's head, causing his plane to spiral out of control, and he disappeared from view. Mario ran back to the mushroom and picked it up, causing a bright, blinding light to appear. The light continued getting brighter and brighter, and more uncomfortable, and it then proceeded to stop suddenly. The gang was left dazed and confused, but unhurt, and they realized they had just been transported straight to Bowser's Keep. Mario, Luigi, Yoshi and Toad hopped up the castle steps and reached the gate. As Mario went to retrieve the mushrooms from his pouch, a ghost snapped it from his hands and giggled. A total of six ghosts emerged from air, and they tossed the pouch among themselves, back and forth. Luigi manages to take it back from the ghosts using his jumping skills, and hands the pouch back to Mario. Toad makes an attempt to distract the ghosts, zigzagging around the room, as Mario began to line up the mushrooms and read the spell: "Eenie, meanie, minie, mo. Send the ghosts were Bad Boos go!" A ray of shimmering rainbow grabbed each ghost, wrapping it in colored light, and causing them to vanish. The voice of Peach's voice was then heard as it cried out, "Mario! Help!". Mario began running through the castle, following the voice, and entered a round room with Peach trapped in a metal cage dangling from the ceiling. Luigi, Toad and Yoshi followed into the room, and through a back door entered Bowser. Bowser began shooting off fireballs across the room, setting Luigi temporarily on fire. The gang of four ran around, dodging the barrage of fireballs, and through their running, they began bumping into one another. Bowser trapped them in a corner of the room, and Mario retrieved the envelope Cybele had given him to use only when there was no hope. Inside he found a letter with the following message: "Once the spell is good and done, Throw the mushrooms one by one. What they do I cannot say, But be sure they'll save the day!". Mario began pelting the mushrooms at Bowser, each one doing something different. The black mushroom cast a cloud of black smoke confusing Bowser, the green mushroom turned into a green bouncing ball that hurt Bowser and the orange mushroom transforming into five small hammers that pummeled Bowser. Trying to fight back, Bowser breathed out a fireball that Toad doused out with the blue mushroom, that turned into a splash of water. Mario threw out the yellow mushroom, becoming a slippery yellow slime that caused Bowser to fall on the floor. Finally, Mario threw out the final, red mushroom, turning into a fireball, slamming into him and pushing out of a window. With the help of Yoshi as a boost, Mario hops right up to the cage containing Peach, and Mario opens it, releasing the princess. After having just rescued the princess, Mario retrieved The Book of Spells from a table against the wall. As Mario put it in his pouch, Cybele smiled from the depths of her forest. Boos (known as ghosts in the book). Wario from Super Mario 64 DS. Toad holding a star from Mario Party. Peach with a star, also from Mario Party. Yoshi from Mario Party 4. Luigi surrounded by Bob-ombs from Mario Party 5. This page was last edited on November 13, 2018, at 07:22.